Innovative and big money-making deals in the international energy industry seem to follow Alejandro (Alex) Cestero around. The general counsel of Frank’s International has a tireless work ethic, but he also seems to have a knack for being in the right place at the right time. 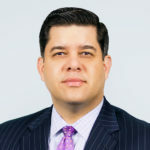 Born in Puerto Rico and raised primarily in Miami, Cestero earned a bachelor’s degree and MBA from Rice University and a JD from Stanford Law School, and has served as general counsel for three global, publicly traded oil and gas services companies by the time he turned forty. Cestero had a one-track mind to follow in his uncle’s footsteps. He spent his summers during college and law school interning at law firms in Houston, which not surprisingly led to his developing a focus on energy law. “When I first started practicing [at Vinson & Elkins], I did a lot of international corporate transactional work.” Cestero, being fluent in Spanish, was offered the opportunity to move to Bolivia to work on an multinational pipeline project very early in his career. “My firm sent me to work on that project before I’d even received the Bar results,” Cestero recalls. He ascended through Pride’s ranks quickly, taking on increasingly complex projects such as a board seat on a billion-dollar venture in Brazil. He was also earning an MBA, paid for by the company, which helped prepare him for overseeing the divestiture of Pride’s offshore shallow water division. That entity became Seahawk Drilling, which he joined as general counsel. His tenure at Seahawk coincided with the Deepwater Horizon explosion in April 2010. “We were in the middle of buying a billion-dollar company, which would have doubled our size. Immediately after the accident, the government canceled drilling in the Gulf of Mexico, and our revenue dropped to zero overnight. Even though it happened in deep water, and our rigs were in shallow water, the government’s ban affected all drilling. In May 2011, Cestero joined Lufkin Industries, where he helped oversee five acquisitions in eighteen months. In July 2013, General Electric purchased the company for $3.4 billion. After the sale, he worked for Weatherford, a Lufkin competitor. In August 2015, Cestero was promoted to senior vice president, general counsel, secretary, and chief compliance officer at Frank’s International. Fourteen months later, the company announced its largest-ever acquisition—the $321 million purchase of Blackhawk Specialty Tools. “My friends often jokingly ask where I’m heading next, since big deals seem to happen wherever I go,” he says with a laugh. Unlike many others in the petroleum business, Cestero says Frank’s does not intend to branch out into alternative energy sources. “We are in this business to stay; it’s what we do. In addition to developing new technologies, we plan to continue to expand our geographic reach. The challenge, especially in some far-flung locales, is how to be compliant, cost effective and secure. When Cestero wants to decompress, he hunts, fishes, and escapes to his 220-acre cattle ranch in La Grange, Texas. He says he is currently reading Raising Beef Cattle for Dummies. In his experience, he can’t just sit still, and even on vacation will find something to become fascinated with. Don’t be surprised if a Cestero beef cattle venture becomes the next big thing.